No food miles and it can’t be any fresher! When you buy from the supermarket it may have travelled from interstate, or perhaps even internationally, which means that it could be days or weeks since it was picked. When you grow food, you will almost always have a point at which your abundance is more than you and your family could possibly consume – so it’s a great opportunity to learn how to preserve or get sharing with family, friends or even strangers. 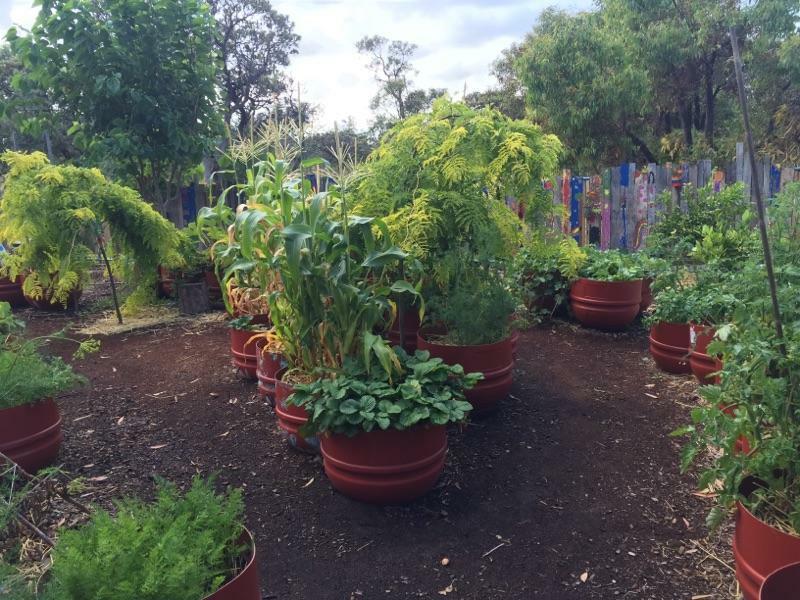 A few suburbs around Australia, and many more throughout the world, are setting the trend of planting their verges with food to share with anyone and everyone, creating a gift to bring together their communities. Suburbs in Australia include Bayswater WA and Buderim Qld. Help someone get started. When you grow edible plants there are often opportunities to gift people cuttings of your plants or seeds you have saved. Cuttings from sweet potatoes, rosemary, a stem of lemon grass or even a tomato lateral are easily plucked for your visitors. Feed the soil. Add lots of organic matter to your soil to create a soft, dark and rich soil. Compost and composted manures are your best friend in the garden! Cover the soil. Putting mulch on your soil keeps your soil and plant roots moist by preventing evaporation. This helps prevent heat stress and creates an optimal level of moisture availability, and will save you money on water. It also adds organic matter as it breaks down. Lastly, it maintains all the beneficial bacteria in your soil that works with the roots of your plants and aids in nutrient uptake. Under the mulch the mycelium, which is fungi that helps break down your mulch, requires that moisture to grow. You can grow anywhere. If you have a small space you will still have room to grow some plants on a balcony or even indoors. Recycle your waste and add it to your garden. Recycling food scraps via compost, worm farm or bokashi means that you can put all the nutrients in them back into your garden. It will save you money and have amazing benefits for your plants, as well as reducing your carbon emissions. When waste decomposes in an anaerobic environment (such as landfill) it creates methane, which warms the earth 20 times faster than carbon dioxide, and it takes energy to transport the waste to landfill in the first place. You can negate both of these issues and reap the benefits by recycling at home. Plant at the right time. Gardening Australia has a month by month calendar for all the areas around Australia. Plant fruit trees that will produce in your area. Find out what other people are growing locally and find out what the chill factor is for your locality. Just a few kilometres can sometimes mean the difference between getting fruit for your efforts or not. Check your soil pH if your plants and trees aren’t thriving. Staying in touch with people through gardening networks gives you wisdom from a large community of growers with thousands of years of experience between them in all types of climates. Facebook is a great place to start. If you want to garden with other people, find a local community garden or permaculture groups. Donating trees or revegetation offsets to contribute towards offsetting emissions through Carbon Neutral Charitable Fund is tax deductible for all contributions over $2.